The Fair has its own website click here to find out details of camping, advance tickets, of how to exhibit and who is exhibiting. Held within the centre on June 29th and June 30th 2019, the fair is the biggest event of its type. The Fair is a great day out (or weekend away) for all the family! Falconers, birds of prey keepers and anyone who has an interest in these wonderful birds is welcome. 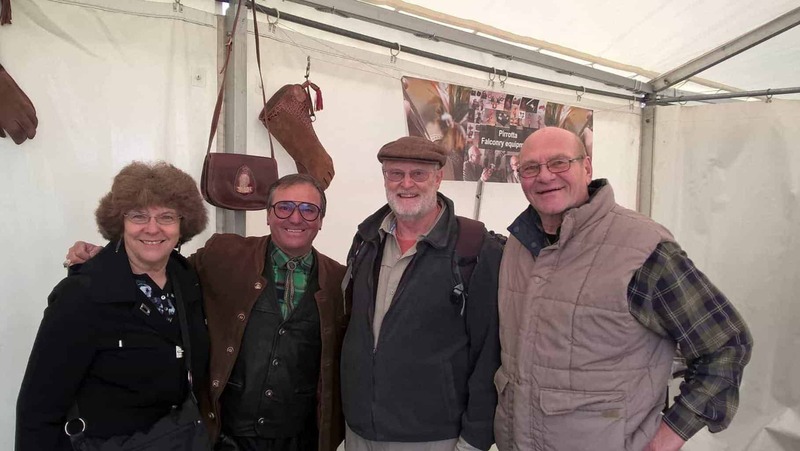 A range of trade stands will be exhibiting their wares enabling visitors to see and handle a range of quality falconry equipment before buying. Visitors have full access to the National Centre for Birds of Prey whilst at the Fair. A range of birds from tiny Burrowing Owls to the gigantic Steller’s Sea Eagles and Griffon Vultures are on display. Our Discovery Centre will host a number of seminars and workshops; Previous seminars have covered subjects from the veterinary care of raptors, hawking in Peru to accounts of flying Black Sparrowhawks in South Africa, so please keep watching the website for more details! Specially invited falconers from all over the Uk will be coming to fly their own hawks during the demos. As usual Simon and Kate Jewitt from Stoneycairn Gun Dogs will be coming to show us all how to have well behaved dogs! For those visitors who want to come and make a weekend of it, our location is on the doorstep of the popular market town of Helmsley, a huge range of hotels and B&Bs are at your disposal. Have a look at www.visithelmsley.co.uk for details of places to stay. A basic camping area is also available within the centre’s grounds – please pre-book as pitches are of limited number to avoid disappointment. You can call us on 08447422035 to book – or book online below. PLEASE NOTE – AS THE FAIR IS HELD WITHIN THE GROUNDS OF THE NATIONAL CENTRE FOR BIRDS OF PREY, WE CANNOT ALLOW DOGS. We have a Facebook group specifically for the fair. Please click here.